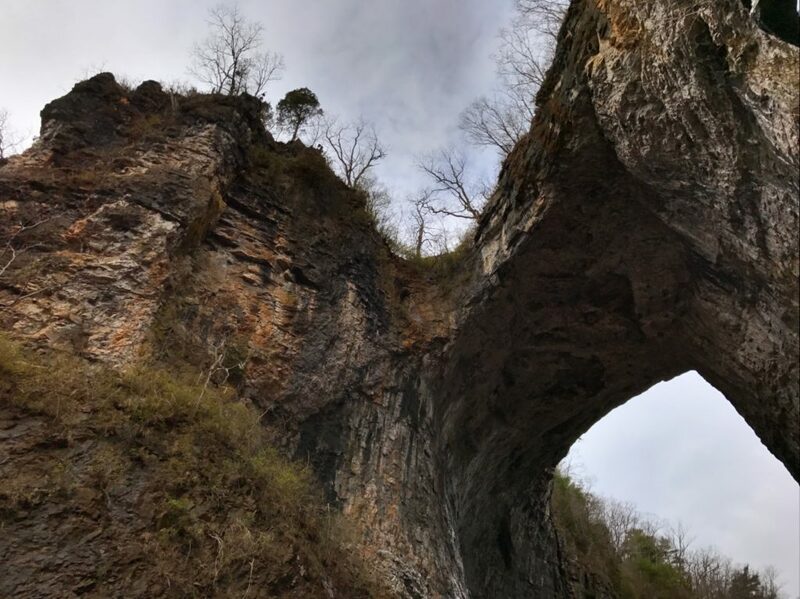 Today was the first time I had visited Natural Bridge in more than eleven years. 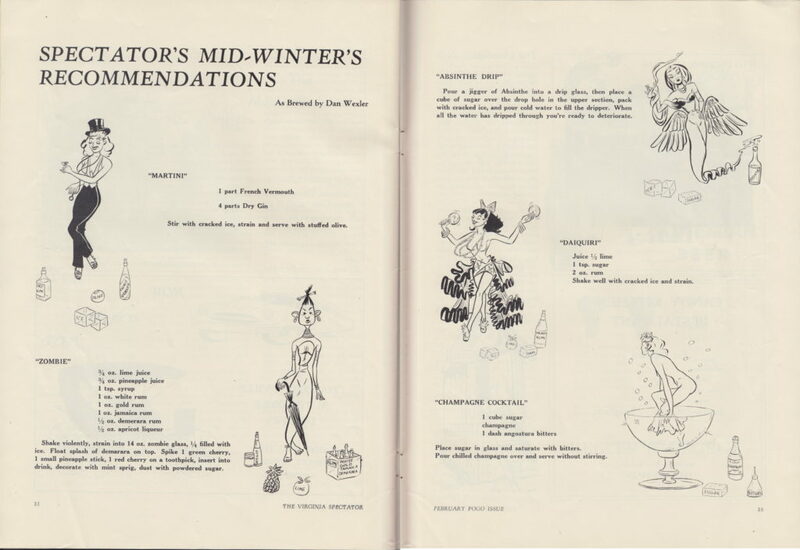 (You can read my previous write-up.) The bridge continues to be more imposing than can be easily absorbed, as the photo above hopefully shows. This time I walked further up the path along Cedar Creek. (I had, after all, paid my $8 for access to the trail.) 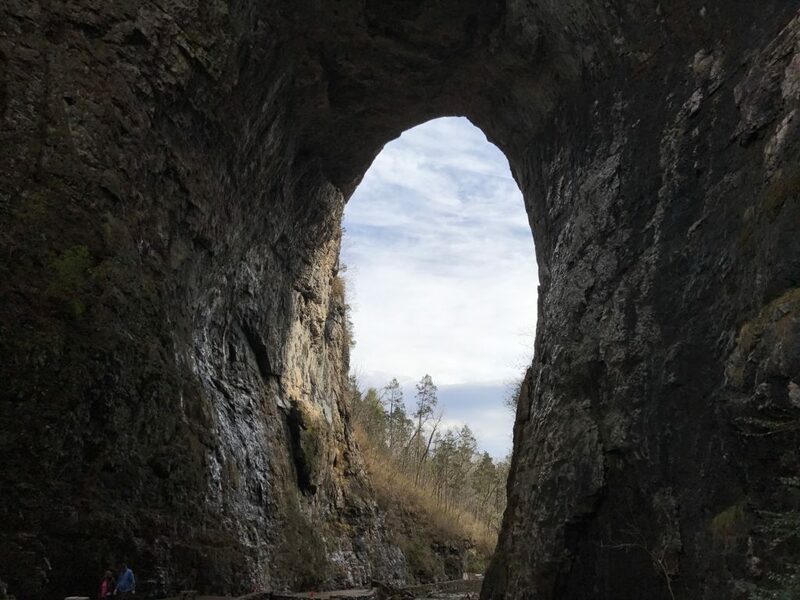 I passed a reconstructed Indian village – don’t flinch, it was done sensitively – and a cave, and made my way to the Lace Falls. Seeing more of the Bridge made me better appreciate Thomas Jefferson’s pilgrimages there – and his practical desire to explore the area’s mineral resources, including opening a saltpeter mine just up the creek. 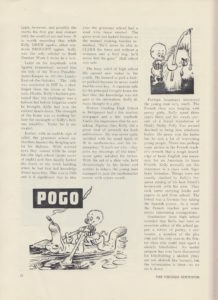 As previously mentioned, I now have my copy of the February 1951 Virginia Spectator, the “Pogo issue” of the University of Virginia student magazine that started out as the literary magazine (jointly published by the Jefferson and Washington Societies) but was by the 1950s more a college humor magazine with the occasional short story thrown in. 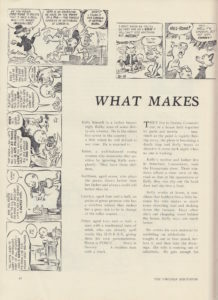 Calling this the “Pogo issue” is based on the incredible Walt Kelly UVa-themed cover (above) which I’ve discussed once or twice before, plus the inclusion of two articles: a biography of Walt Kelly and a discussion of the characters in his most famous comic strip. 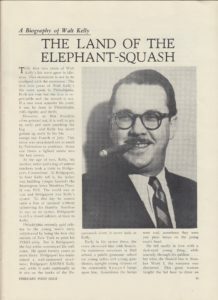 “The Land of the Elephant-Squash,” of which the first three pages are reprinted below, was later reprinted in the Okefenokee Star fanzine and in Fantagraphics reprint collections. 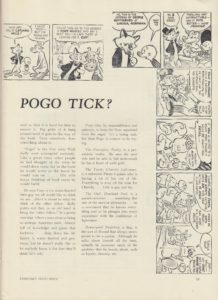 “What Makes Pogo Tick?” is less often reprinted. Reading both, there is nothing to tie them to Virginia, but this appears to be the first time both appeared in print. Following yesterday’s link regarding the possible fate of the Confederate war statues donated to the City of Charlottesville by Paul Goodloe McIntire, I thought it might be worthwhile to dig a little deeper. 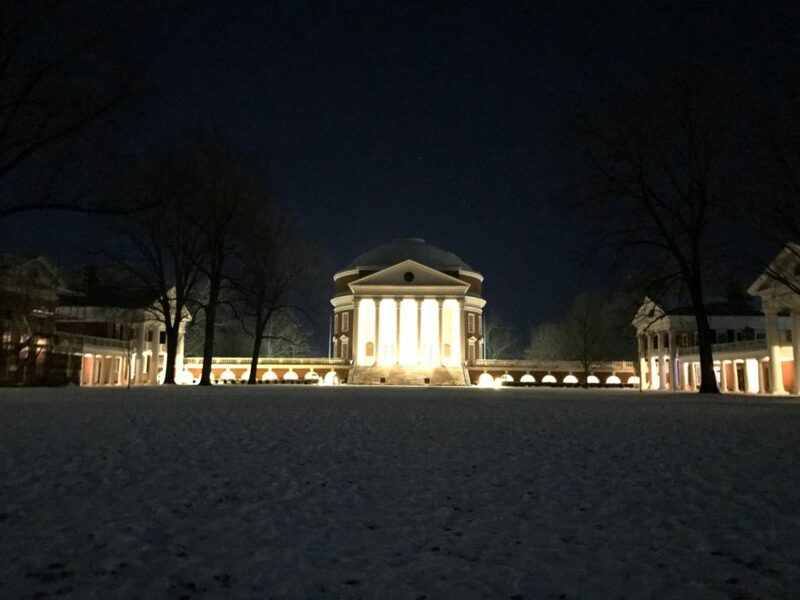 Was McIntire, a huge donor to both the city and the University of Virginia, a virulent racist like composer and white supremacist John Powell? It seems many have been asking the same question, and as you might expect the evidence of his intent is a little murky. Let’s start with the facts. McIntire, after having made his fortune on the New York Stock Exchange, returned home to Charlottesville and started giving away that fortune. In addition to the school of fine arts, the amphitheater, and other gifts to UVA, he donated land and money for parks in Charlottesville, including two white-only parks (Belmont Park and McIntire Park). At the same time he donated the land for McIntire Park, he also donated the land for the all-black Washington Park. Was he on the side of white supremacy? Or was he simply endowing all Charlottesville’s citizens, black or white, within the scope of the prevailing legal framework of “separate but equal”? It’s hard to say. An article in CVille Weekly notes that “he did invite the Confederate Veterans, Sons of Confederate Veterans and the United Daughters of the Confederacy to plan the statue’s [Lee’s] unveiling.” But given the heavy concentration of Confederate veterans in Virginia, was this like inviting the Klan or only like inviting the Disabled American Veterans? I don’t know if we will ever get a good answer on this, given that people like Ben Railton and Waldo Jaquith have been plumbing it since 2009. But it’s worth continuing to remind ourselves that many who have been held up as civic heroes were also products of their times. 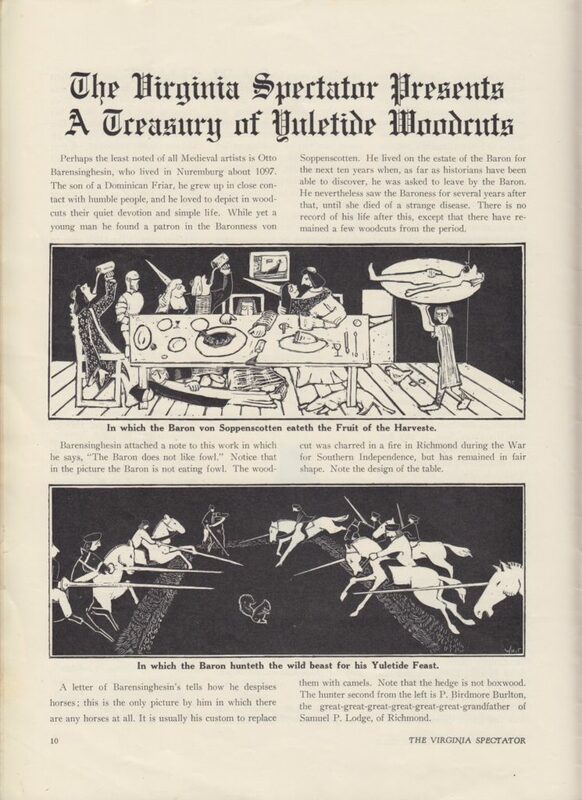 And, with Railton, to remember that we have many public spaces dedicated to the narrow Confederate view of history, and to call for more reminders of how life was on the other side. A tail from out her rear! Mommy’s eyes just never had that look. 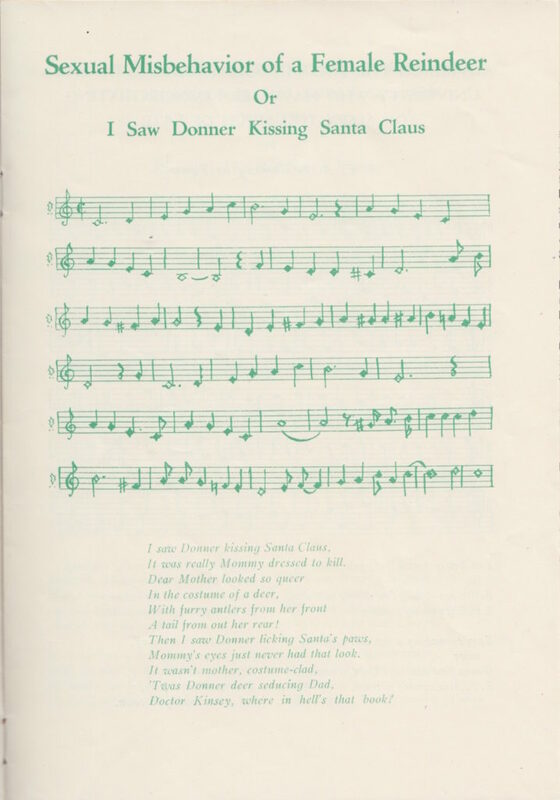 ‘Twas Donner deer seducing Dad! 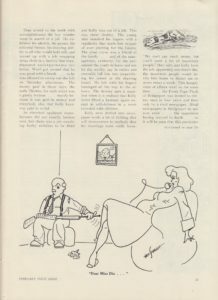 Doctor Kinsey, where in hell’s that book? I’m one step further along on my ultimate UVa checklist. 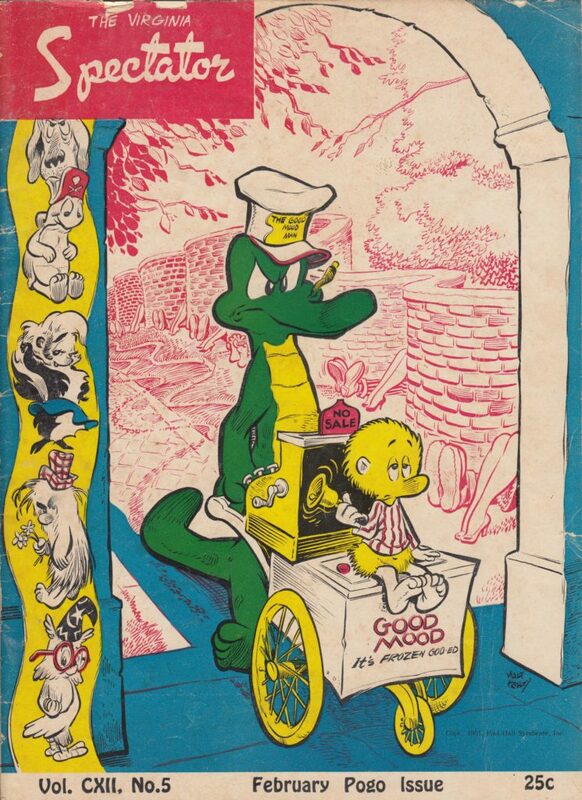 Last week I received my copy of the February 1951 Virginia Spectator, the one with the cover by Pogo artist Walt Kelly showing Pogo and Albert the Alligator trying to sell ice cream to all the college students and their dates trysting in the serpentine walls at the University of Virginia. I hope I find time to scan bits of the magazine in the next few weeks. Seven years ago today, I summed up the things that happened eight years ago before that: the small amount that I could write, stunned, on September 11, 2001; my more elaborate write-up from 2002 and, after singing in the Rolling Requiem, my detailed recollections from the day; my thoughts from 2003, on the brink of invasions; my thoughts from 2008, in which I assert that in spite of the attack, we’re still here. All of which is to say I thought I had processed and finished my grieving for the victims of that bright fall day fifteen years ago. 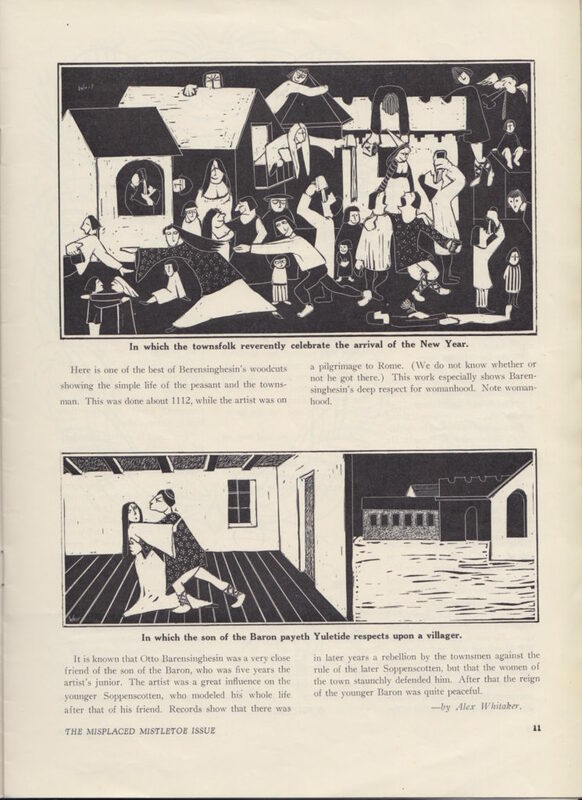 Then, one night this week after rehearsing Adams’ On the Transmigration of Souls, I attempted to describe Doug Ketcham to one of my TFC colleagues. And I could not speak. I was suddenly dumbstruck by the immense unfairness of what happened to him: twenty-seven years old, a rising star at Cantor Fitzgerald, who retained enough presence of mind to call his parents from underneath his desk after the first plane hit the towers to tell them that he loved them. Doug was an acquaintance who I wish I had known well enough to call friend. Other UVa friends, like Tin Man, knew him much better. But he was a decent human being who never blinked an eye when I joined the crew that hung around with him. He made you feel less alone. 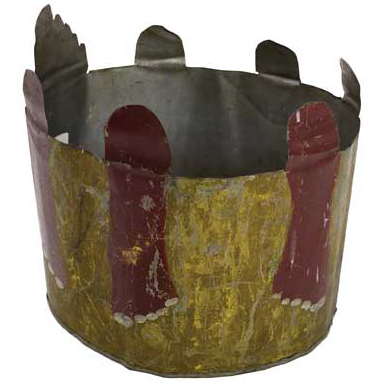 I spent some time thinking about him in our final rehearsal of Transmigration on Friday. I thought about the fact that I haven’t come to terms with his death after all these years. I thought about the fact that this anniversary still has the power to turn me somber and sour. But after the transfiguration moment, the chorus drops away, the instrumentation drops back down, and you can hear that the voices and names are still speaking. And so it goes until the end of the work, with a final wordless tone cluster from the chorus yielding to a slendering thread of string sound, which after the thirty minutes of the piece finally resolves upward into a new major key—but not triumphantly, but so quietly it can almost not be heard. And I think about this ending, and I think I finally understand what Adams was trying to get at. The dead are still with us after the transmigration because they always will be. It is we who must be transmigrated, who must allow ourselves to be changed, to not continue to stand, breath held, on the edge of that dreadful day. We who must resolve upward. UVA Today: More Green Space Planned for Ivy-Emmet Entrance Corridor. Buried in the discussion, as it was when an early version of the plans were discussed over the summer, is the proposed demolition of the Cavalier Inn. The BOV will take up the question of whether to proceed with the plan in December. Here’s hoping that enough data accompanies that discussion—like hotel vacancy rates and walkability options for visitors to the University—to set my mind at ease. Author Tim JarrettPosted on August 31, 2016 Categories VirginiaLeave a comment on Bye-bye, Cavalier Inn?